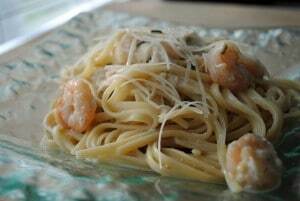 Here is a healthier alternative to the usual high in calories cream sauced pastas! You can file this one under your favorites. I know you’re going to love it! While the pasta cooks, melt the butter in a 12 inch nonstick skillet over a medium high heat. Add onions and garlic and sauté for 1 minute or until tender. Add the shrimp and scallops and sauté for 3 minutes or until done. Reduce the heat to medium low. Add the next 4 ingredients; cook for about 3 minutes or until thoroughly heated, stirring constantly (do not boil). Sprinkle 1 cup of cheese over seafood mixture stirring constantly; cook for 1 minute; stirring constantly. Remove from the heat. 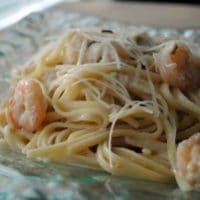 Combine the pasta and seafood mixture in a large bowl. If there is a lot of liquid, try simmering on low for about 5 minutes to let the sauce thicken a bit. Garnish with shredded Parmesan and parsley.